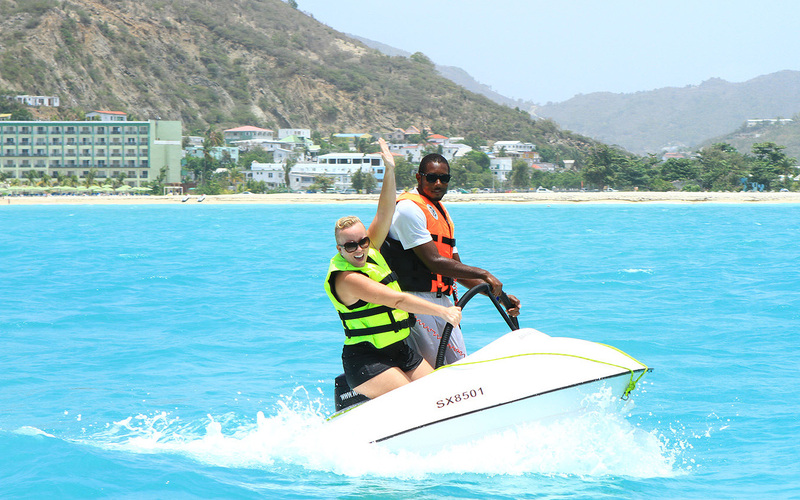 One our recent trip to St. Maarten we discovered three great activities I recommend to anyone. All are family friendly. 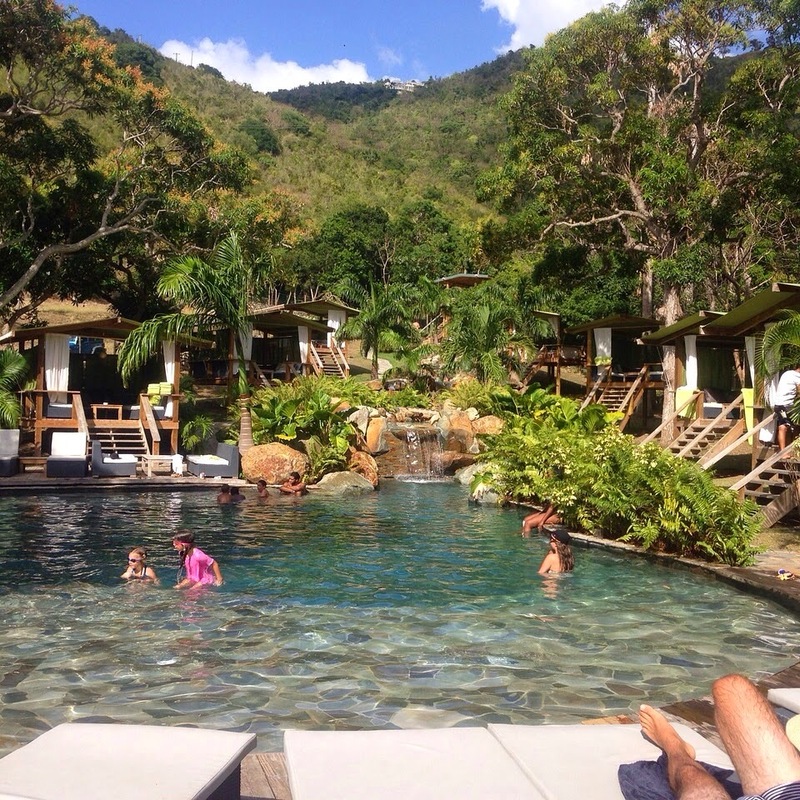 Located on the French Saint-Martin Loterie Farm is a nature sanctuary with a fabulous restaurant, zip lines, hiking trails and pool area. We started with lunch at the Hidden Forest Café with great comfort food in an amazing nature setting. Then we moved on to zip lining the Fly Zone – 35+ feet off the ground whizzing between majestic mango and mahogany trees on a series of ropes, cables, and suspended bridges. But my favorite spot on the farm was L’eau Lounge – a gorgeous haven featuring a natural spring-fed swimming pool and jacuzzi. You can get lounge chairs for the day and order food and drinks. Music is always playing by a DJ perched above in a tree house. Overall, it was a great relaxing spot and one we will definitely go back to. couldn’t resist the pun). Water UFO (which stands for Unbelievably Fun Object but it does look a little like a flying saucer) was designed and created by the owner, the energetic Nancy. I loved her from the first minute she hugged me so hard I was lifted off my feet. Her creation is the only such watercraft for salt water. The UFO is motorized but it has no steering wheel or handles. You steer and turn using only your body weight. Since most of the time you are in the craft with another person it is a real exercise in teamwork since you both have to do the same thing to steer it effectively. If you are a bit timid to take it out by yourself or with another notive, one of the UFO team will gladly go out with you. They claim no one has ever fallen out which I find hard to believe since the combination of choppy water and my tired arms risked breaking that record. The experience was great and different. We highly recommend you try this out! We headed to Cheri’s Café in Maco Village on our first night in St. Maarten and man! It was a great way to jump into our week experience. The menu is vast and the food good but the entertainment is what you go for. Sure it is a little tourist-trappy but who cares when you laugh that hard? “The Sweet Chocolate Band” provides the only live dinner show in SXM. The guy’s humor, wit and vibe are contagious and you cannot help but sing along and wave that silly hand clapper. I mean … what else would you do when a grown man comes out unapologetically in a banana costume singing about … well … “bananas.” I love the fact that they encourage dancing and letting loose on the dance floor regardless of age. The young kids particularly seemed to like that. This is a great place to come as a family and to make some fun memories. I have lived on three Caribbean islands within the last seven years and have traveled extensively through the region with past jobs so I have a pretty discerning eye when it comes to vacationing in the Caribbean. 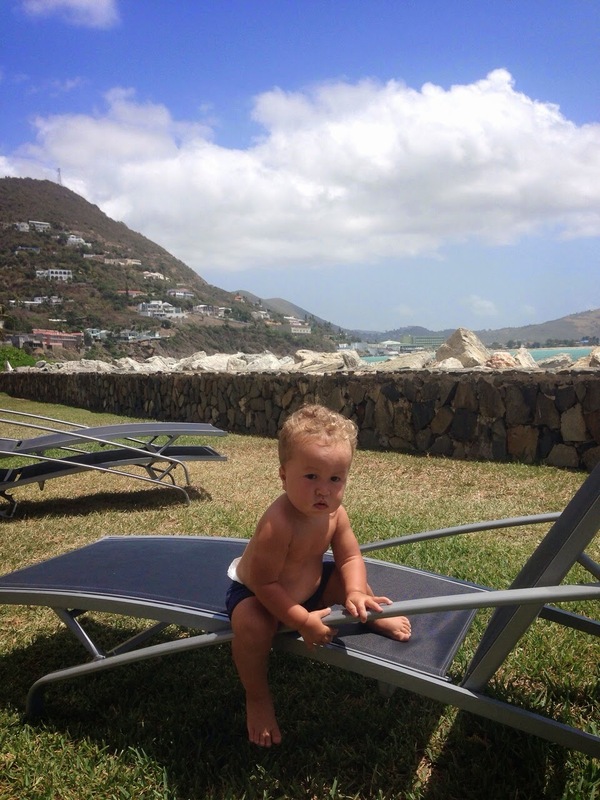 And do I have a recommendation for you … St. Maarten! 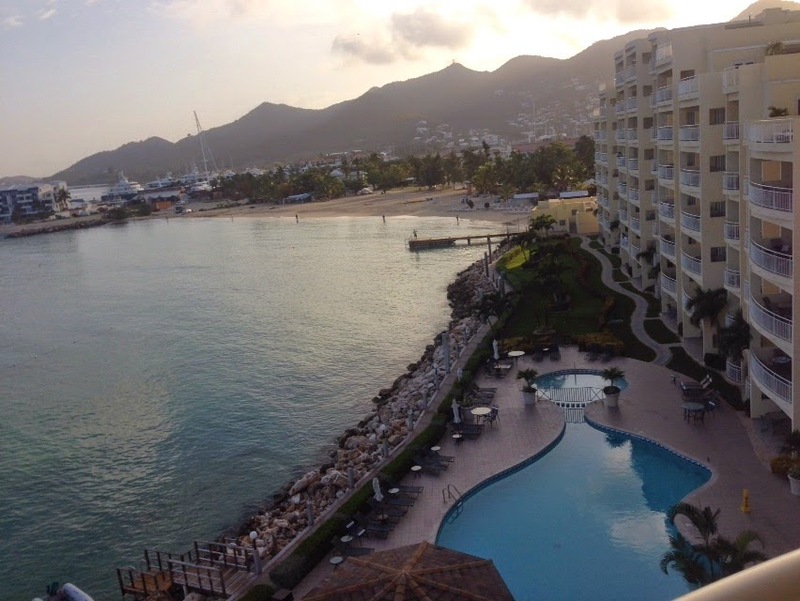 A couple of weeks ago I went on a “work-ation” to St. Maarten. I’ve been there twice before but this time I took the chance to bring my husband and kids along. So my perspective was very family-focused and I was impressed at every turn. We started at Simpson Bay Resort in Simpson Bay. The view was lovely and the staff pleasant. They assign each room to a personal concierge who is available to answer all your questions and help coordinate your activities. The resort’s location allowed for an easy walk to a lot of restaurants and an adorable little grocery called Peli Deli. We went there every day to pick up things I could prepare using the microwave in our room. Is it bad that the young cashier at Peli Deli remembered me from my trip last year when I stayed at a neighboring resort? I don’t care if it is … I was flattered. We moved to Divi Little Bay which I must stay is aamaaazing. Sure the location is stunning and the amenities impressive but it was the people that won me over. The staff was fabulous from General Manager Celine Van Meer, to Sales Manager Joan Samson to all the folks in Reception, Housekeeping, Maintenance, Food and Beverage and the Spa. From the first step on the resort we were greeted with incredible warmth that continued to the minute we left. For a family, this is the perfect resort. The rooms were great and they had activities for all ages. We stayed in a one-bedroom unit that had a full kitchen, living room, dining area, two bathrooms and a big bedroom. My kids were in heaven with the space and the grass yard in which they could run away when they got tired of pool or beach time. Divi’s main pool is kid friendly and the beach is conveniently a few steps away. The second plunge pool is a great escape and offers a to-die-for view of the sunset. It’s deep so not so great for the kids unless they are full swimmers. But it’s great for parent bonding (hint hint). The resort also have several Jacuzzis around for a nice soak. I hopped in one night after the kiddos and hubby feel asleep. Adelaide’s favorite part was the Kids Club that has daily activities. She made her very own tie-dye shirt and she and Oliver played in the Club a few times when Daddy needed to keep them busy when I was out working. The Spa was fabulous. I’ve visited many spas throughout the world and I definitely grade the ladies at Indulgence by the Sea with very high marks. My Swedish massage was perfectly relaxing and therapeutic, and my pedicure was spot on. Divi Littl Bay offers four on-site restaurants but if you prefer to prepare meals yourself, they do offer a little grocery on site that we … of course … patronized every day. The boutiques have clothing items I would actually buy (and I did) and there is a decent fitness center. For those looking for action, the water activities were varied (jet skis, kayaks, paddle boats, etc.) and available to guests at no additional cost. Can’t beat that! A big, hearty special thanks goes to Janelle Hermance of the St. Maarten Tourist Bureau for making all arrangements and ensuring the experience was a smooth as Oliver’s baby bum. More about SXM Carnival and other attractions in my next post.